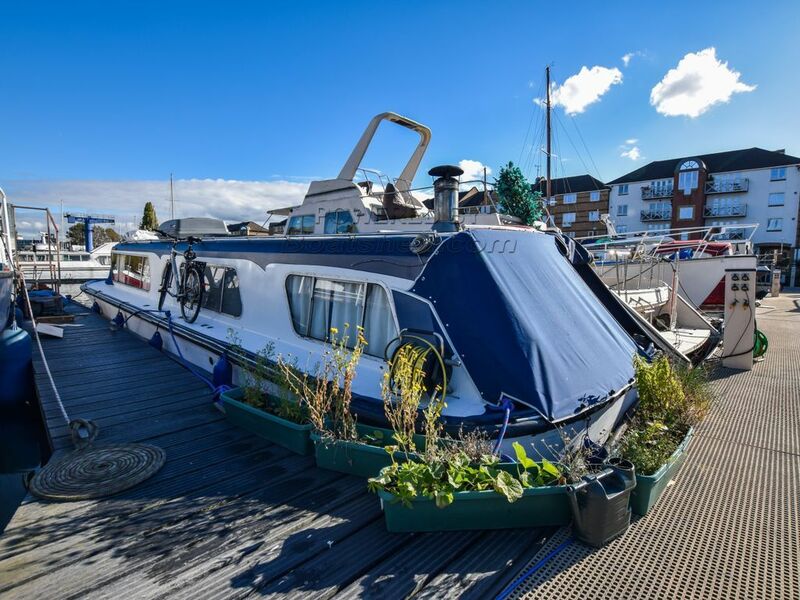 Boatshed London are delighted to offer this lovely 39ft Wide Beam cruiser for sale with London residential mooring. This boat has been recently renovated completely internally and is a perfect liveaboard for a couple or individual. The current owners have created a bright and spacious houseboat by turning the layout around to have the cabin at the bow and a good sized living area and galley at the stern. South Dock Marina is an extremely popular marina because of the quietness around the marina and excellent transport links. Surrey Quays (10 mins) and Canada Water (18 mins) are all within walking distance and there is a River bus pier next to the marina. The residential mooring is fully transferable although the marina charge a 10% transfer fee. Current mooring fees are approx £500 per month making this one of the cheaper marinas in London. The facilities block is on the same pontoon as this boat with loos and showers and there is also a laundry in the main yard. This Wide Beam 39ft With London Mooring has been personally photographed and viewed by Angus Rose of Boatshed London. Click here for contact details.